Favorite Fabric have a heap of freebie patterns for you all to grab. 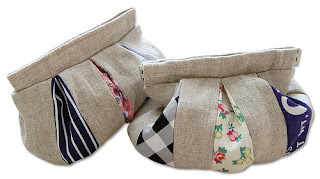 I have made these fabric baskets before from a tutorial and love making them. They are great for paper napkins or coasters and can be made in any size just by adjusting the size of the square of fabric used. 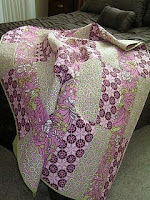 They have a lot of free patterns on their website to browse through....quilts, totes, aprons and so much more. 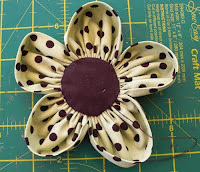 Pop over to my blog Sew Prim Khris for a simple fabric flower tutorial. You can use this on your tote bags to dress them up, put a brooch pin on the back, add a hair tie for your hair, make a magnet or simply hang it from your door knob or a hanger. Teresa over at All Things Vintage shows how you can make a block keeper using a cardboard cylinder you can buy at the post office. I made one of these many years ago and it is very similar to Teresa's except I finished both ends of the fabric and then sewed velcro on the one end so that it wraps around the cylinder. You can then take it off if you ever need to wash it. Moda Bakeshop have a tutorial to make a turnover table runner called Choc O Cherry. 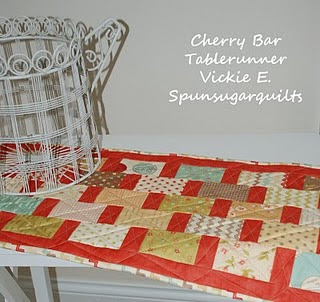 I really need to give this a go with some turnovers I got recently.... and I love table runners. Dawn has got a nice simple place-mat tutorial to whip up and shows how you can personalise them with letters. 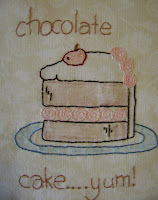 Dawn also has a cute cake stitchery to grab as well here. Kviltsvina has some cute Valentine heart stitcheries she is sharing. Lettie from Polka Dot Pineapple has a tutorial for a geometric pincushion. At first I thought it would be hard but it's so simple. Take a look. Pink Penguin has a tutorial for a Puffy Pouch. Very cute and practical. 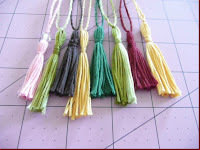 Julie from Bush Baby Jag has a nice simple tutorial to make tassels using DMC thread. Thanks for sharing Julie. I was trying to find a tassel one day not long ago for a project and couldn't find one and never even gave it a thought about making one. 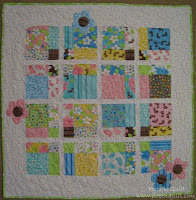 Piece N Quilt have a cute baby quilt that she has made using charm squares. This is basically an altered nine patch variation which would make up nice and quick and looks so cute with these lovely soft colours. 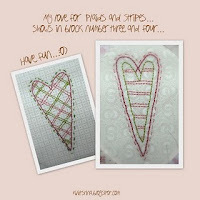 Natalia has a few different tutorials on her blog as well as a lovely Hugs & Kisses quilt over at the Moda Bakeshop. A friend on my CRAFT group was asking after a pattern with a wine bottle and I just found this cool paper pieced block over at Patch Pieces with a wine bottle and wine glass on it. They have a few good blocks over there to look at. Quilt Happy, Quilt Often has a redwork BOM called "Love Is" that she is sharing with everybody. Paula is posting two blocks per month on the 10th and the 25th. Robert Kaufman has a heap of freebies to keep us busy for a life time. 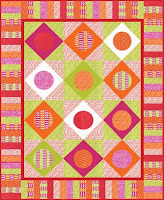 This quilt called Mingle would be nice and easy to make up and you could applique any shape on the block if you chose not to put the circle. 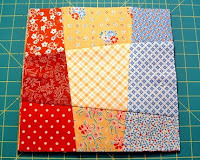 Jenny over at Allsorts has a tutorial showing how to make a crazy nine patch block. Very effective and simple and would make up a quilt fairly quickly. Okay its a bit late for Christmas cards but if you want to start getting ready for this year The Confessions of a Sewing Dork has a really simple and effective handmade Christmas card to whip up....you could easily have a heap of these ready for December. Don't you just love her catchy blog name! 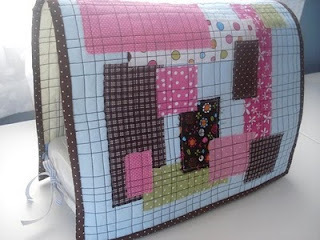 Tracy from Mad Quilter has a heap of tutorials and patterns on her side bar but take a look at this cute Mandy bag. She has mad this with a pocket to fit her i-phone in it. Tracy from Mad Quilter has a cute little Babushka doll pattern she is sharing with us. 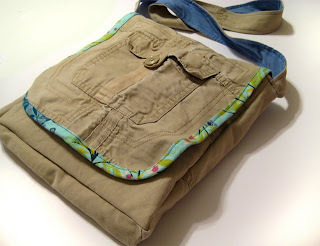 Noodlehead has a tutorial on making a messenger bag from an old pair of cargo pants, could use jeans as well I think and with some funky material for the lining etc would look great. Fat Cat Patterns are having a row row by Christmas quilt BOM. Very cute indeed. Staring now in January and finishing up in August. January is up now until the next block goes up on the 1st of February. On the 5th of each month, for 12 months, you'll find a new quilt block over at Bunny Hill Designs. At the end of 12 months you can stitch them all together to have a winter quilt in time for Christmas! Polka Dot Pineapple has a tutorial on making wire edged flowers out of scraps of leftover material could look great with some funky colours all mixed together. Arlette has a heap of other tutorials to check out too. ReannaLily Designs has a nice easy drink coaster tutorial with a fussy cut circle in the middle of the coaster. Sew Inspired blog has Audrie from Blueisblue as a guest blogger and she has done a super easy tutorial for a sewing machine cover using up scraps of material. 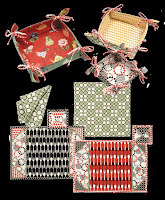 Quick Quilts have some freebies over on their site. I love this Partridge in a Pear Tree applique they are sharing with us. 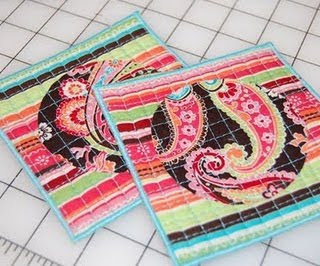 Marilyn and Robin over at Two Wacky Women have a nice easy peasy quilt to whip up called Simple Rails. Marilyn explains more about it on her blog Marilyn's Maze. Go grab the pattern and make up a few....they have made it to use 3 different yards of fabric for the top which makes things nice and simple....right up my alley. Woman's Day has a tutorial on how to make this cute fabric flower...it could be used for lots of things....on your handbags, hair ties, hair bands, as a hanging ornament....probably lots more uses than that too. 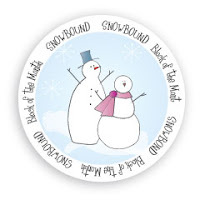 Bird Brain Designs have another lovely stitchery to grab called Wonderful Winter. Clothmatters has a few different free arty cloth doll patterns. Take a look if you are an artsy cloth doll maker. There is a fairy, bee, cat and duck pattern there.